Our friends at Blue Cat Audio have today announced the release of their newly re-designed Plug’n Script plug-in with a generous 20% off MSRP introductory price, ending November 5th 2017. 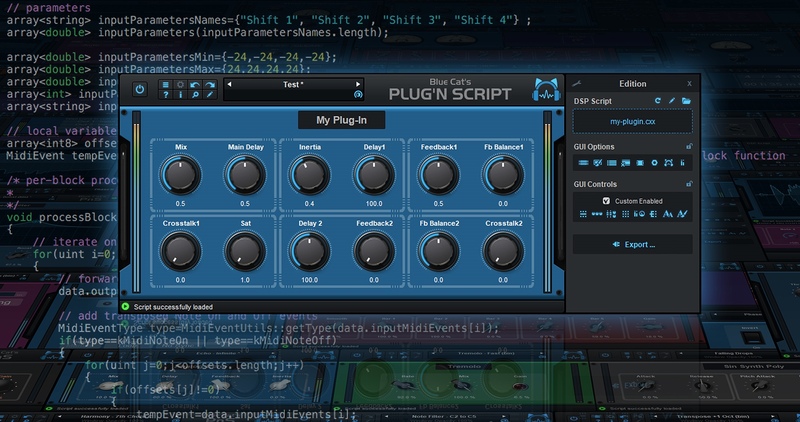 Blue Cat Audio’s Plug’n Script is an audio and MIDI scripting plug-in that can be programmed to build custom effects or virtual instruments, without quitting your favorite DAW software. With this plug-in, you can write your own plug-in with very little knowledge about programming. If you do not care about programming, Blue Cat’s Plug’n Script can also be used as a regular multi effects processor with existing scripts or to get someone else write this very particular utility you have been searching for years and cannot find anywhere. Brand new GUI design, with improved usability and touchscreen support, fully zoomable. Scripts can now be exported as independent VST plug-ins. Customize the user interface in the plug-in (no code required), or write your own layout for each script. Separate player and editor modes for optimal workflow. Parameters display format can now be set by scripts. Retina displays support on Mac (high resolution for text and vector graphics). New version of the Angelscript engine (2.31.1). Fully compatible with previous versions of the plug-in. Fixed minor issues on Mac OS High Sierra. Fixed native file recorder script issues (file names were not properly generated for rotation). Fixed MIDI channel issue with VST3: MIDI channel for note events was offset by one in the VST3 plug-in version. Removed specific mono and stereo versions for the VST plug-in – please uninstall previous version first if you do not need them (new installer will not remove them). Warning: changed the identifier of the VST3 version on Mac. See this post for more details. Blue Cat Audio’s Plug’n Script v3 is available here, at the DontCrack Store. This entry was posted in DontCrack, Plug-ins, Promotions and tagged Blue Cat, Blue Cat Audio, Design, Plug'n Script, Plug-ins, Scripting. Bookmark the permalink.